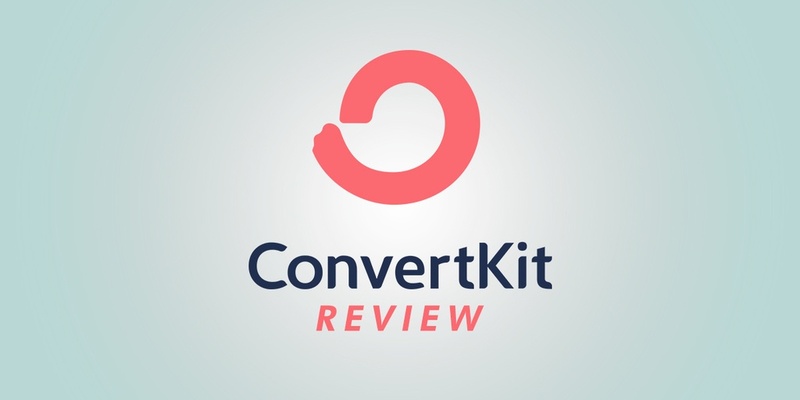 ConvertKit Review – Best Email Service For Online Course Creators? Email marketing is absolutely fundamental when it comes to selling your online course. You build connection with your tribe of people by email and you pitch your course via email. So having an email service which is built with this in mind is really important. In this ConvertKit review you'll learn what features you absolutely need, and why Convertkit is the perfect email service if you're just getting started with online courses. 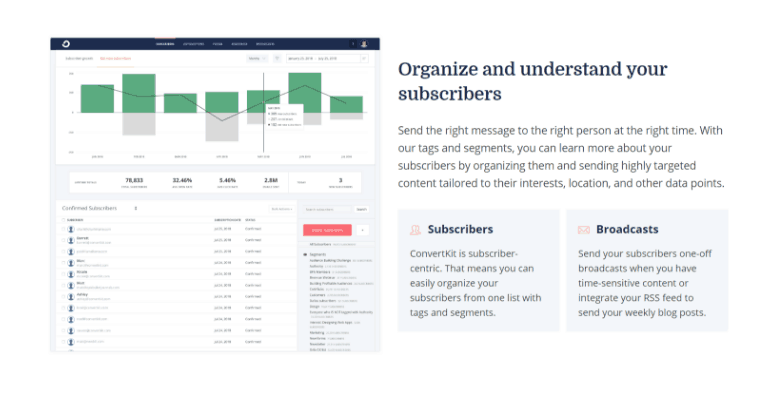 ConvertKit is an email service provider (ESP), focused on offering a simple intuitive platform for you to capture email leads and build a better relationship with your following via email. It is designed specifically for podcasters, bloggers, creatives and all other sorts of internet businesses that need to build audiences and convert their email subscribers into regular paying customers. The business was started in 2013 by Nathan Barry, the famed designer, blogger and entrepreneur. Over a fairly short amount of time, it's generated quite a buzz. ConvertKit now has more than 20,000 active customers (including some big names like Pat Flynn), and it earns over one million dollars each month in recurring revenue. I've been using ConvertKit for the last 3 years, and after using 3 other email services, I have to say I'm impressed by the way ConvertKit has married simplicity of use and a powerful set of features into one platform. ConvertKit is a business tool with all the bells and whistles that will help you create, manage, and maintain any sort of email marketing campaign. You just need to register, create your account and you’re good to go. The software is based on five different building blocks, so let’s take a closer look at each of those. 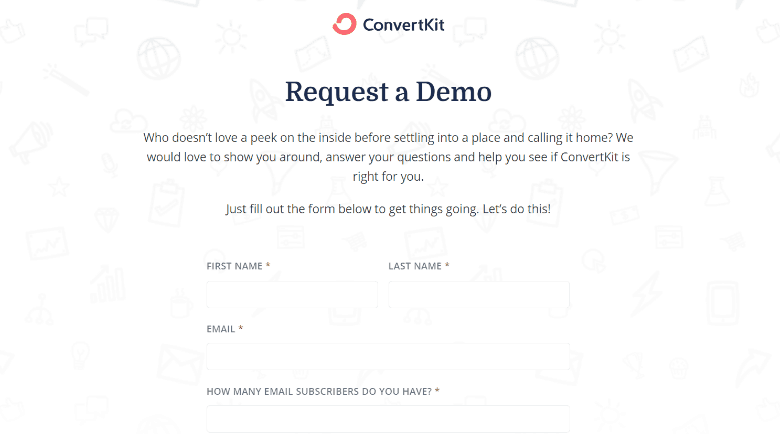 ConvertKit forms are designed to make it easy for you to capture email subscribers for your account. You can incorporate forms as a popup or simply embed them into any page on your website or blog. You can even create separate landing pages for these purposes, all within Convertkit. Forms come in three different styles: clean, minimal, or full. All three have a clean and understated look, but unfortunately there aren’t that many customisation options in the supplied form editor, which might be too limiting for certain businesses. The same limitations apply to landing pages as well. If you already use another software for capturing your email leads or building landing pages on your website, you probably won't need to use the ConvertKit forms – they are designed really for people who don;t have this element in place already. Your ConvertKit account contains a database of all your subscribers, and they can all be segmented into different groups by using tags. There are no lists, as is the case with some of ConvertKit’s rivals like MailChimp and I have to say I much prefer it like this. It's much more dynamic and enables you to see each subscriber as an individual who might be interested in a range of different topics, rather than just on one particular list in your account. Your subscribers can also be grouped or filtered by any custom field such as subscription date, the form they joined your list through, any tags they might have and much more. A clever thing is that you can see stats for each and every subscriber, so if you want, you can really dig in and get to understand your subscribers interests and behavior. The way ConvertKit handles subscribers is really a huge benefit of the platform. It's flexible and powerful – to understand it fully, check out their complete guide to ConvertKit subscribers here. In case you want to send a one-off email to any filtered groups of subscribers (or simply all of them), you can easily do that as well. Once again, as there are no lists of subscribers, you can segment them easily by using filters. You can use filters so as to condition broadcasts to specific products, tags, sequences (more on this in the next segment), or the aforementioned forms. Included in the email editor for broadcasts are several cool options such as the A/B button for split tests or the personalisation button you can use to merge different tags. Probably the most useful feature for online course creators are ConvertKit Sequences. These are a sequence of emails that you can line up and send to your subscribers at a schedule you define. On other email services these are often referred to as autoresponders, but sequences really reflects more accurately what they are. You can then have another ‘sales sequence' that people can opt into (by clicking a link in one of your emails) to find out more about your online course. You send a series of emails educating them about your course, showing them the value of it and testimonials from others etc. If they join, they can then enter another sequence – your customer ‘on-boarding sequence' where you welcome them to your course with a series of emails helping them get the most from your course and offering a way to build even stronger relationship, get feedback and stay in touch. It can get much more complicated than this, but in essence you can see how these sequences of emails can become the building block of your email marketing system; nurturing new subscribers into happy customers. For more info and some examples, check out ConverKit's complete guide to sequences here. The cherry on top of all the other building blocks are the automations. They help you to automate your communication with all your subscribers, and there are four different ways an automation can begin – by means of a form, by being tagged, by updating any custom field, or simply by making a purchase. Once that occurs, a subscriber moves into an automation that you have built and begins to move through it. Inside that automation you can add events, actions, or conditions to the actions that your subscribers take. Conditions make it easy for you to create ‘if…/then…' type scenarios. Actions mean adding and removing tags, adding a subscriber to an email sequence, creating a custom field, or creating a time delay. When an event occurs, it pulls your subscribers to the next step of the aforementioned sequences. Simplicity is the key here and it's what makes ConvertKit's automation sequences stand out from competitors like ActiveCampaign. All the interfaces are clean and very easy to understand and operate and by reading ConvertKit's complete guide to automations, I think anyone would be able to get one set up. Another great thing about ConvertKit is that you can set your email campaign up in such a way that different emails get sent to your subscribers in accordance to the actions they’ve taken. 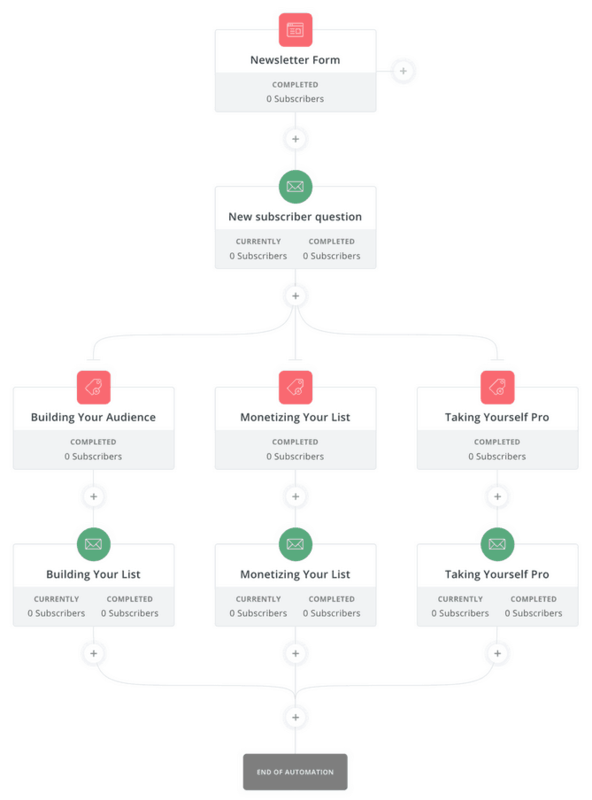 Subscriber segmentations become much easier this way, and you don’t have to rely on any lists. For example, a subscriber might click a link within an email you’ve sent earlier. Clicking on that link will tag him/her and put them in a specific segment. You can set your campaign up so that each time this occurs the subscriber gets enrolled in a webinar or gets a subscription to a course, or whatever else you have in mind. There is even a radically simplified marketing funnel interface, which makes all your sales funnels a rather easy process to pull off. You just need to add all the content into the funnel and start sending the emails to your subscribers. This makes it super easy to build a email marketing funnel for your online course sales. If you are selling something, you better have a good landing page for your product or service. There are people out there who are very talented when it comes to making sales, but not so much when they need to design something. This is where another cool ConvertKit feature comes in very handy. It is a very simplified landing page creator which requires no HTML or coding knowledge. Once you open it, you can choose one of the three predefined layouts, and then fiddle with the text, change all the colors, upload images or videos, etc. If you have some CSS knowledge, you can get into tiny details and fine tune your landing page just the way you want, but that is totally optional. Hosting is very important for landing pages, so you can choose from moving the page to any of your own domains by means of a simple WordPress plugin, or you can host it on ConvertKit’s own servers. On top of all this, you can easily add lead magnets to your new landing pages, as ConvertKit offers full support of such endeavours. As mentioned above in relation to the forms, this feature is not going to be that useful if you already use a more advanced landing page builder like LeadPages or Thrive Architect. It goes without saying that you need proper reporting and analytics tools to track your campaign and determine whether it is successful or not. As is the case with almost all the features in ConvertKit, you can do this rather easily. The programme gives you different options of tracking, so you can always check what’s going on with your visitors, email opens, subscribers, bounces, and conversion rates for each and every campaign you run. On top of all this, you can also measure and observe how various forms perform, so you can determine the tactics that provide you with the best results. Last but not least, you would probably expect that a reputable service like ConvertKit to come with proper customer help and support, and you wouldn’t be disappointed. Unfortunately, there is no live chat or phone support. However, you can send an email to an agent for customer support 24 hours a day, every day of the year, and they reply rather quickly. On top of all this, they are very generous with various help articles that cover everything that might be causing issues. They also provide different types of training materials and workshops for those who are looking to learn and excel in the world of email marketing. First of all, we need to be clear on one thing – ConvertKit doesn’t come with a free trial plan, and there are no discount offers whatsoever. From time to time, you might stumble upon a free 30-day promotion, but they occur rarely. On the other hand, the whole package comes with a 30-day money-back guarantee. 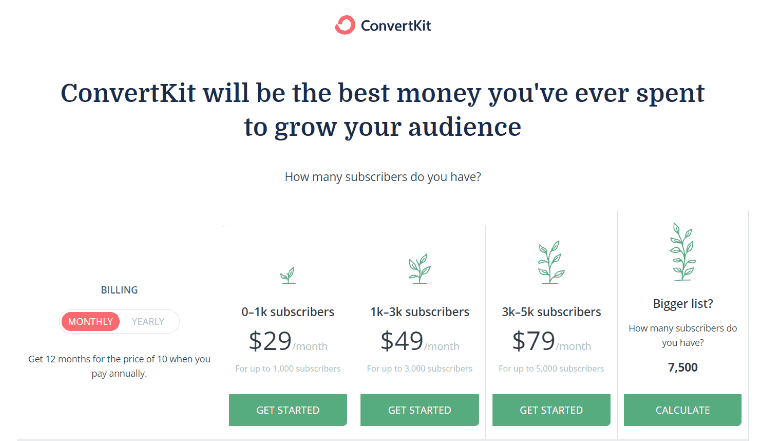 Just like any other email marketing services, ConvertKit’s pricing is based on the number of subscribers. The more you have, the more you will pay. In a direct comparison to similar services out there, ConvertKit’s pricing can be considered middle-of-the-road or maybe a bit higher, especially for those who have less than 10,000 subscribers. But once you exceed that number, ConvertKit becomes very competitively priced. The monthly fee for up to 500 subscribers is $29, and the price doesn’t actually go up until you surpass the 1,000 subscribers mark. Having up to 2,500 subscribers will cost you $49 per month, but when you double that, the price goes up to $79. If you have up to 10,000 subscribers, expect to pay a monthly fee of $119, while having 15,000 subscribers will set you back some $149. Keep in mind that if you pay for a whole year, you will get 2 months for free, regardless of your number of subscribers. Now, before we make the final verdict, let’s go through the list of all ConvertKit’s pros and cons. ConvertKit is a very good email marketing service that’s carved out quite a niche for itself in just a few short years. 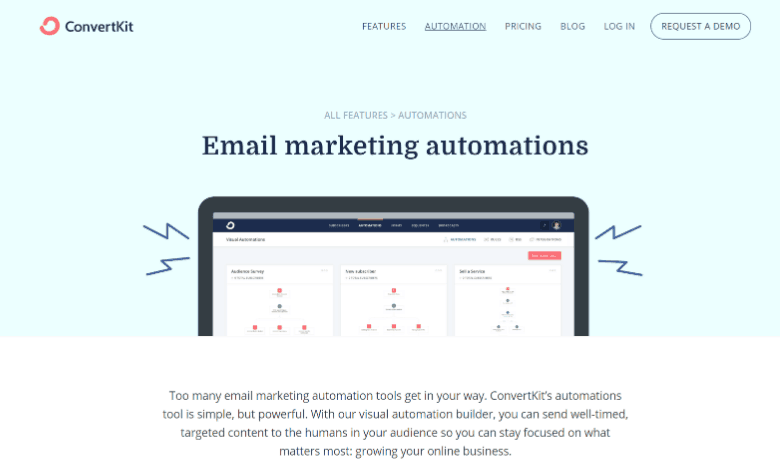 The future of email marketing lies in automation, and ConvertKit offers simple to use automation features to help you nurture your email leads and generate sales. It may not be the most capable for complex email marketing campaigns, so if you're looking for something with complete flexibility and all the features under the sun then check out ActiveCampaign., which offers quite a bit more than Convertkit (but it nowhere near as easy to use!). For anyone just getting started with email marketing, or who wants to keep it simple and easy to manage themselves, then I'd highly recommend ConvertKit. It is easy and quick to use with a very intuitive interface – and that is worth a lot for anyone who wants to focus primarily on creating great content. But it also combines this with all the essential features you need to build an email list, and nurture those subscribers into happy online course customers. I use it myself and I happily recommend it to anyone incorporating email marketing into their online course business. LMS vs. Membership Plugins: Which Should You Use To Create An Online Course? How Much Does It Cost To Create An Online Course?